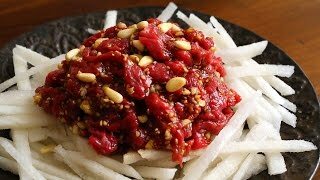 Korean seasoned raw beef (yukhoe) is a delicious, fantastic totally unique dish: cool, garlicky, nutty, a little sweet and of course meaty! It makes for a great side dish for drinking. My recipe uses a lot of garlic, so plan in advance for garlic breath! This recipe has been a favorite in my family for a long time. Over the years I’ve tried many different versions in restaurants and experimented with ratios, but I always come back to this one. I love the contrast between the strong garlic, sesame oil flavor, sweetness, saltiness, and cool beef. Many Korean restaurants add an egg yolk to the middle of the plated dish, but I’ve never liked that method. I don’t alway want egg yolk on my yukhoe. But recently I’ve come to enjoy a yolk on the side, and this way you can ask your guests if they want a yolk of their own, instead of putting it on the dish for all to share. Give your family or guests a little freedom, let them dip their yukhoe in a yolk, if they like! One of the keys to this dish is to buy fresh, good quality beef that’s tender and has almost no fat. I find it best to talk to my butcher directly and tell him I’m going to eat it raw, so he (or she) can recommend the most suitable cut. If you can’t talk to your butcher, you have to be careful to buy the freshest you can get from a place you trust. The other key is to make sure everything is cold. I keep my beef in the freezer for an hour or two before making yukhoe from it, that way it’s a little icy, easier to cut, and really cold when it’s mixed with seasoning sauce. Try not to handle it too much with your warm hands when you cut it, so it stays cold. I chill my serving platter too, by putting it in the fridge. 8 ounces (226 grams) of fresh tender beef. Choose any tender cut of beef without fat: flank steak, filet mignon, round, etc. Freeze the beef for 1 to 2 hours. Make the seasoning sauce by combining garlic, green onion, soy sauce, honey, ground black pepper, sesame oil, and sesame seeds in a bowl. Mix it well. Mix 2 cups of cold water and 1 tablespoon sugar in a bowl with a spoon. Peel the pear and cut it into matchsticks. Soak them in the sugar water for about 10 minutes. Drain the pear sticks and dry with paper towel. Put them on a plate, clearing out a spot in the center to put your yukhoe. Take the beef out from the freezer and rinse it in cold running water. Pat dry with paper towels. Cut the beef into thin matchsticks and then Mix it with the seasoning sauce. Place the yukhoe in the center of the plate of pear matchsticks. Sprinkle with pine nuts and serve right away as a side dish for alcohol, or as a snack or appetizer. An optional egg yolk for dipping can be served to each diner. Posted on Wednesday, April 7th, 2010 at 11:37 am. Last updated on February 26, 2016. Posted March 6th, 2016 at 1:48 am | Log in to reply. Hi Maangchi, What are some other side dishes this can be had with?, planning on making it for dinner one night this week. Posted March 6th, 2016 at 11:25 am | Log in to reply. I think kimchi stew, japchae, bok choy muchim, and braised tofu will go well with yukhoe dinner party. I’m sure you don’t forget to make rice. : ) Good luck with your Korean food party! Posted December 17th, 2015 at 10:06 pm | Log in to reply. I’ve slowly transitioning to the mega-paleo caveman diet; carnivore basically. Raw meat. It’s a great diet but you really need to find unconventional recipes and I am glad I found this thread. I recently moved to San Fran and was wondering if anyone had any recommendations for a Halal? I’ve been asking locals for meat at local watering holes but haven’t found a decent place to by cuts yet. Posted March 3rd, 2016 at 6:09 pm | Log in to reply. Go across the bridge … Oakland Halal for meats and Saba for very fresh halal chicken. Both in Oakland. I think there is a larger Muslim community in the East bay, and the Fremont area than there is in SF. Posted October 4th, 2013 at 1:10 pm | Log in to reply. I made this last night and finally remembered to take a picture before indulging like I usually do! It was sooooooooooo delicious with Korean pear. Thank you so much for the recipe, Maangchi! The best part was the full flavor from garlic~! Posted October 5th, 2013 at 7:46 pm | Log in to reply. “The best part was the full flavor from garlic~!” yes, you are right. Cheers! Posted December 19th, 2011 at 2:19 pm | Log in to reply. 1. Have you ever made, or had, Yukhoe Bibimbap? I had this many times at a restaurant in Seattle WA USA, called Shilla, and it was wonderful. Served Bibimbap style with a raw egg on top. Each time I had it, I had to argue with them to serve it to me (I am not Korean heritage)! But delicious. 2. Who does your music for your videos? Do you choose it? You have great selection of 80s New Wave (Altered Images, The English Beat, etc.). Just wondered. Thanks and Rock On! Maangchi Rules! Posted December 11th, 2011 at 9:30 pm | Log in to reply. I don’t know if I know how to order the freshest beef in Korean… but maybe I will bring a co-worker to help me ^_^ I love Yukhwe! Posted December 14th, 2011 at 9:35 am | Log in to reply. Posted October 28th, 2011 at 4:00 pm | Log in to reply. Posted January 9th, 2014 at 4:23 pm | Log in to reply. Apologies for the thread necromancy, but in case anyone new is reading this. . . Yes, raw beef can make you sick, but the risk is far, FAR lower than westerners seem to think. Those E.Coli incidents were generally due to factory-ground raw beef that was left in its ground state for a long time, and were left undercooked at the restaurant. If you take some basic precautions, you can avoid the risk of getting sick greatly (I’ve never gotten sick, despite all the times that I’ve eaten raw beef). 2. Don’t cut up the meat until it’s time to serve. Bacteria can’t grow deep inside the meat: they can’t penetrate the structure, so they mostly live on the surface. Keep the meat in one piece until just before serving. If you want, you can cut the surface off the meat and only use the interior portion to further decrease the risk of contamination. Don’t throw those bits away, though: marinate them in a little bit of Maangchi’s bulgogi marinade, cook it up in a frying pan, and serve it over a bowl of rice as a nice snack for the cook! 3. Don’t let the raw meat sit at room temperature for too long a length of time. If you’re serving large amounts to a large number of people, prepare small batches and rotate them out regularly. I’ve never done this, but once per hour might be a good rule of thumb: make one batch, place a couple more filets in the freezer to firm up, take away any leftovers by the time you make the second batch (although I seriously doubt you’ll have leftovers, since this dish tends to go quickly. Again, so long as the beef isn’t completely spoiled, you should be able to cook any leftovers you don’t feel comfortable serving raw: so long as it’s thoroughly cooked, you should kill any bacteria that happen to have taken up residence. 4. WASH EVERYTHING. Sterilize your cutting board (several web sites can teach you how to do this), don’t use the same cutting board for meat and vegetables, wash your knife and hands and mixing bowl, and make sure the plates and vegetables you serve this on are freshly washed. Reduce cross contamination: make sure that the equipment you use for making yukhoe ONLY gets used to make the yukhoe, and thoroughly wash them before you use it for anything else. This one VERY BASIC precaution can save you a ton of trouble! 5. Your tongue and nose are actually very good indicators of whether or not food is spoiled: that’s what they evolved to do! (Much of the time, when people get sick from undercooked beef, it’s because the undercooked parts are hidden from the nose and tongue by the properly cooked exterior.) Smell and taste the meat before adding the seasonings and serving to your friends. It should taste clean, slightly metallic, and meaty. If it tastes bitter or spoiled, toss it out. I don’t mean to say that raw beef is perfectly safe, but then no food is: people have gotten sick from raw spinach and such. 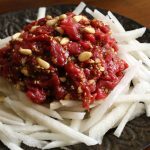 But the risks of eating raw beef are overblown in the minds of many Americans: many of those same Americans wouldn’t think twice about eating sashimi at a reputable restaurant, and yukhoe is much the same. Take basic precautions, and you can enjoy delicious steak tartares and yukhoes without having to spend long hours hunched over the toilet. Posted February 1st, 2011 at 5:00 pm | Log in to reply. Posted January 8th, 2011 at 10:36 pm | Log in to reply. Posted January 9th, 2011 at 7:53 am | Log in to reply. Posted November 22nd, 2010 at 6:16 pm | Log in to reply. I remember when I ate this with my dad. I didn’t really like it, but I think it was the cut of meat. It tasted a little chalky and not very flavorful. He put more on my plate, though, saying “It’s good for you! Eat up!” I’ll have to make this myself and see if it comes out better. This recipe was originally posted on April 7, 2010 at 11:37 am by Maangchi. It was last updated on February 26, 2016. The video was watched 465,752 times on YouTube & has 8,206 likes! This video is a remade version of an earlier recipe. The original video was posted on 2010-04-07 and has 103,396 views.